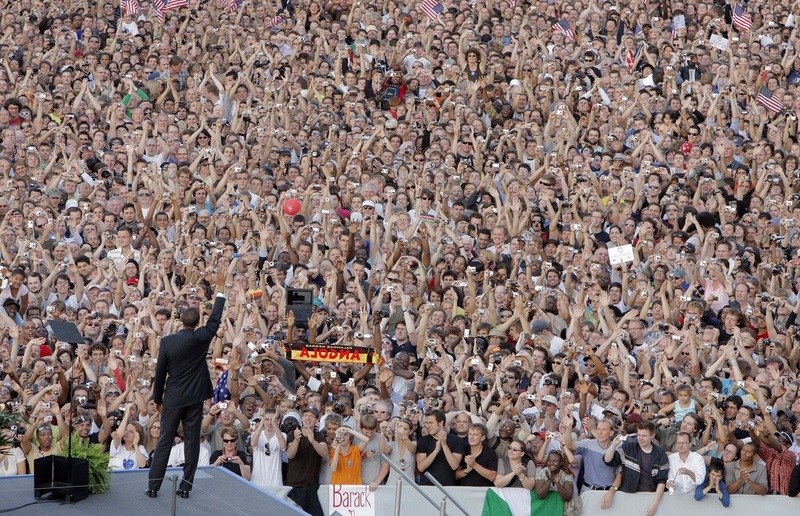 Dave Winer linked to this AP photograph taken of Obama speaking to a group of 200,000 Germans in Berlin this week. Seeing all those American flags causes me to pause in wonder. How do we go about rebuilding the damage we’ve done to our allies over the past eight years? I believe this is a step in the direction but it will take years to repair. It took a picture of the Democratic nominee speaking to a bunch of Germans to finally give me hope that we can turn things around here in America. I’m still not entirely comfortable casting my vote for Obama but I’m heading that direction. The more I hear him speak the more hope I have for a better America. Can’t we just have Mit Romney as president? I’d be more comfortable with him. Get this country in the right direction financially then have a candidate that is strong on Foreign policy…(insert wishful thinking) McCain and Romney as running mates. I’d be more comfortable with that than any Obama and running mate combo. Obama may be a “rock star” in the media’s eyes but can he back up with what he says?